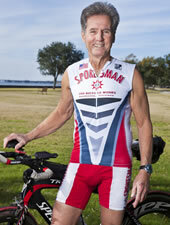 On April 17, 2011, at the age of 70, Les Dauterive finished first in his division as he qualified for one of the world’s toughest triathlon events – the Ironman 70.3 World Championship. Although he fell short of repeating first place honors at the championship race in Las Vegas that September, Les found himself energized by the experience and determined to compete and improve his performance every year thereafter. And if improving physical performance year after year sounds like an idle boast from a man in his 70s, you should take a lesson on training from this triathlon champion. Life-long, regular exercise has rewarded Les with excellent health and vitality. More importantly, decades of training have given Les a highly developed awareness of his body and how it reacts to everything in his environment, including his physical activity and state of mind. This awareness, possible only through years of life experience, has shown him the value of listening, observing and constantly modifying his training regimen for optimal effectiveness. Les has learned that improving performance is not simply a matter of doing the same thing, like running or swimming, over and over. Seasoned athletes like Les understand that listening to your body means more than just reacting to pain or fatigue. It requires a comprehensive understanding of your physical wellness, your mind, and how one muscle or one mental image affects everything else. It requires sensitivity, patience and time – something that only comes with life experience. Les has adopted this holistic approach in his training, and his victories prove its value. And that’s why we would never bet against this 72-year-old man, who plans to improve his performance year after year. Les Dauterive … Peoples Health Champion.